Platens and molds can be heated by passing steam through them. This water vapor (i.e. steam) is heated between 250-550°F from an outside source such as a boiler. Boilers are generally heated with electricity or natural gas. Boilers (both steam and hot water designs) are designed to burn various fuels and transfer the released heat to water and steam (in steam boilers) and to water (in water boilers). Codes and standards address the allowable heat transfer rates based on the internal heating surface area. All boilers are classified based on working pressure, fuel used, size and shape and other factors. These factors impact initial cost, performance and space requirements. All systems allow for connecting to a piping system, delivering the heated steam or water and hot water to the point of use, and returning cooled fluids to the boiler. Natural Gas-fired boilers are commonly applied in either low- or high-pressure designs; and, in general, operating economics favor the natural gas choice when larger volumes of steam or hot water are required. Both high- and low-pressure designs are commonly applied. High-pressure systems are designed to operate above 15psig steam, or above 160 psig and / or 250°F for water boilers. 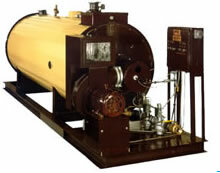 Steam boilers are typically available in standard sizes up to and over 100,000 lbs. steam/hour.